This first part is a short piece on their basic formation, without going into too much detail. The second piece digs right into the tactics and analyses their build-up play in terms of attacking organisation.This will be followed by the third part which is a continuation of the attacking analysis and details how Simeone’s men set-up in the attacking third in attacking phases. The final part analyses the factor which Atletico Madrid have received much praise for- their defensive set-up. Currently stationed at top spot in the league, Atletico Madrid have exercised a brilliant brand of football this season. Although the league position may indicate very little, the fact that they beat league leaders Read Madrid this season and held them away denotes that they have put themselves among the elite this season. Provided there isn’t much fluctuation in their league form, it is of no doubt that their final league game, (May 18) at Camp Nou, will frame their league performance. Under Simeone’s tactical approach, they have progressed to the semi-final stage of the UEFA Champions League, where they face two legs against 2012 champions Chelsea. Over the few previous seasons, Atletico Madrid’s tactical approach has been constantly over-shadowed by the prolific strikers they have had in the team. Any opposition report would show that they have put a lot of work into finding a way to stop their trademark talisman striker. It has been no different this season, with Diego Costa filling the void left by departing striker Radamel Falcao. Having amassed 22 league goals already, he currently holds second place in the league top scorer’s chart, a place behind Real Madrid’s Cristiano Ronaldo. The acquisition of David Villa has also proven to be positive, with 15 goals in all competitions for the classy Spanish forward. Attacking midfielder Koke has picked up the most assists (18) for the team in the all competitions this season. The rest of the midfield has also been equally essential in supporting the quick transitional play that the team has developed over the years. Despite having a tactical framework established for their striker to excel, Atletico Madrid have the best defensive record in the league this season, having conceded only 22 goals in 32 league games (0.68 goals conceded/game) . That is 4 goal better than Barcelona’s defence (26) and ten goals better than the all-star line-up of neighbours Real Madrid. 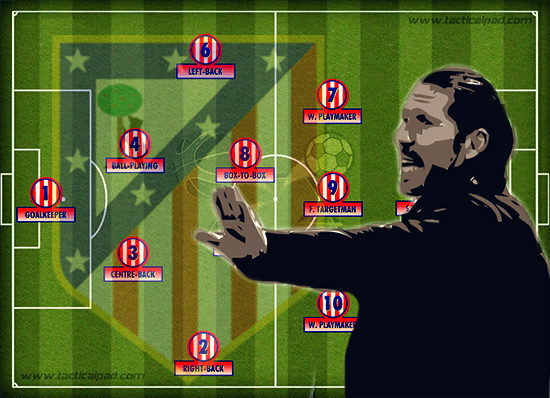 The quick-paced attacking set-up of the current Atletico Madrid is a masterpiece of its own. Strikers Costa and Villa boast half (35) of the team’s total league goals (70). Even setting up theoretical and statistical outlets aside would still not eliminate the fashion of football they have put on display on the pitch this season. The little pieces of tactical brilliance in their set-up were initially the most difficult parts to notice. As the analysis unfolds, you will notice how these micro-philosophies are practically applicable, and how they complement the primary philosophy of the establishment. 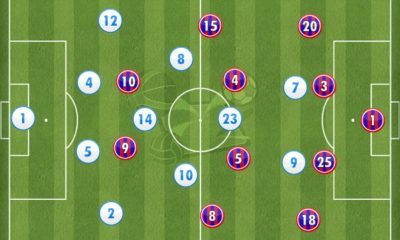 After the arrival of David Villa, an initial 4-2-2-2 formation was more than inevitable to accommodate him alongside Diego Costa. 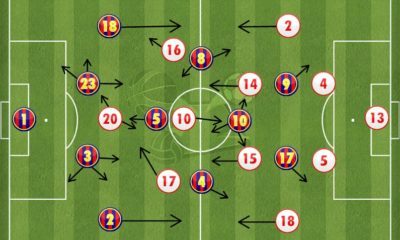 However, under close observation, the formation has moved towards a 4-2-3-1 over the course of the season, particularly in favor of attacking spearhead, and subsequently the team. The new set-up reduces the creative stress on the lone striker. An increased fluidity can also be observed in the progressive/offensive third. With less demand to labor in the process of bringing the ball up to the attacking third, the striker now has more time for establishing movement in the box. The placement of the playmakers out wide has a significant role in the organization of play. The position behind the striker (No.10 role) is not a traditional No.10 playmaker, but rather a ‘False Target-Man’. The position proves to be another significant part of the entire attacking set-up. Striker: Primarily a goal poacher – looks for scoring opportunities. Central: A FalseTarget-Man –starts behind the striker. Poses an aerial threat and serves as the initial long-ball build-up option. Left and Right: Wide playmakers – more crosses from the left and a roaming playmaker on the right. Defensive Midfielders: One anchors the midfield to the defence. The other midfielder plays box-to-box – largely responsible for forming triangles, connecting passes and pushing the ball wide. Central Defenders: One has a ball-playing role – plays plenty of long balls out wide. The other has a more limited role – usually looks for a short pass to the Anchor or alternatively the full back. Goalkeeper: The goalkeeper, (generally) playing more a traditional role, either plays a long ball out wide or to the false target man, or a short pass directed to the ball-playing defender or the Anchor.